The aromatic (artificially flavoured) blends were not as easy, as we did not have access to the chemical formulae which make each blend unique. 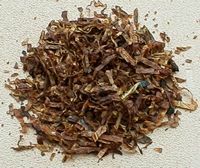 We now import smooth Burley-based, concentrated flavoured tobaccos from the USA and flavoured Virginias from Germany, which are then blended in South Africa to our instructions. The smoothness of Turkish and Burley, with the slight sweetness of gently matured Virginias, and a little top-dressing for a pleasant aroma gives a delightfully easy smoke, mellow as Old Gold. Light and delicate, yet smooth and cool smoking. Savour the ever-popular cherry aroma and the naturally sweet taste. Dark, smooth, easy burning and very aromatic. A not-too-rich, cool smoking tobacco, cut in the American granulated style. "Maraschino Cherry" is the superb aroma of this tobacco, which has a sweet natural satisfying flavour. Slightly stronger than medium, easy burning cube cut. Slightly stronger than medium it contains a little flake to create a sweetly mellow flavour, cool and easy-burning, with a delightful aroma. A very popular rubbed flake, slightly stronger than medium, with a subtle fruit flavour. A tasty slow burner, good for outdoors. A ready-rubbed medium strength, mildly aromatic flake. A blend of broad cut, fire-cured bright Virginia, with dark tobaccos for body and the addition of Latakia and a little Turkish to balance the flavour. 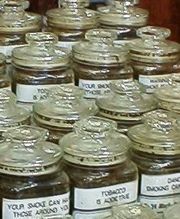 A traditional English Blend of Virginia, Turkish and Latakia tobaccos, smoothed by the addition of fine American Burley. A lovely clean smoke. A subtle and unique blend of exotic Perique, Latakia and local tobaccos. The three-quarter strength mixture is a piquant variation of a Latakia blend. Ready-rubbed, fruity, medium strength flake, with a high percentage of Perique. It is rich and slow burning. 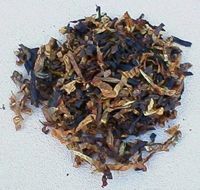 Ready-rubbed, of slightly more than medium strength for cool smoking, it is a blend of rich, matured flakes. Many years ago we developed this fine cut, easy burning mixture. It's so easy to smoke it almost burns by itself. Full strength, dark, rubbed flake. Non-aromatic. Ideal to strengthen a blend. 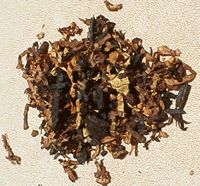 This tobacco makes an excellent flavouring agent, taking away any cloying sweetness. It normally constitutes up to 15% of a blend. by long cold maturation, it is strong and spicy, and less than 5% is usually sufficient. Note: It is very difficult to spread pure Perique evenly throughout a mixture - it is much better to mix it in before processing. To create an homogeneous blend including Perique, use No.58 which contains a high percentage of Perique already spread and mellowed, and much easier to incorporate. One of the most important factors for enjoying your pipe is to find the correct tobacco for the occasion. The answer is to experiment methodically; and we would like to help. so it is quite practical to try each type, and eliminate the flavours/tastes you don't like. Nos. 1, 15, 24, 25, 41, 43, 46, 47, 55 (total of 110g of tobacco). or Nos. 1, 43, 46, 47, 55 (total of 50g of tobacco). The pack includes a copy of “The Perfect Blend” which helps to identify and correct problems. Available in a simple pouch – or in a stunning glass tobacco jar (below left). a change in flavour, but may be hesitant to try a new blend. This is the time to try a different pipe. - since they don't have the flavour of lightly charcoaled briar. You'll be surprised and pleased at the change. Have fun experimenting, and don't be shy to ask. Enter our two-monthly Free Sweepstake by completing our Database Form. CIGARS - smoking for pleasure/ The Complete Pipe Smoker/ The Perfect Tobacco Blend! Cherry, Chocolate, Liquorice, Peach, Vanilla , Menthol. Until we have obtained clarity on these points we are removing the “BUY NOW” option from all pure tobacco products on the website.